Twenty years ago, A-ha recorded what I think is the last great James Bond title song. "Goldeneye" was good, a potent combination of Tina Turner singing U2's composition. But it was the unlikely synth pop group from Norway who really pulled off a truly compelling title song, with tricky key changes, wide open production, a veritable mix of dark Europop and John Barry snazz. For many years, Bond title songs were memorable ballads sung by Matt Munro ("From Russia With Love", Nancy Sinatra ("You Only Live Twice"), Louis Armstrong ("We Have All The Time In The World"), Carly Simon ("Nobody Does It Better"), Rita Coolidge ("All Time High") and Shirley Bassey ("Goldfinger" and "Diamonds Are Forever"). Tom Jones added some histrionics for "Thunderball" and Lulu's "The Man With The Golden Gun" was so-so, even it picked up the pace. McCartney's "Live and Let Die" was a good pop song, but nobody would ever say it "rocked." It was not until Duran Duran entered the picture with "A View To A Kill" (1985) that the drums really exploded, the guitars slashed and the sampled brass popped. With full permission now to get fast and loud, A-ha put their own Europop twist on the title song. If you live in the US, you remember A-ha has the three good looking guys who starred in one of MTV's truly pioneering videos in their song "Take On Me." But if you have lived in Europe and the UK, you know that A-ha has been a pop supergroup for years, with high charting albums and greatest hits collections. For this film where Timothy Dalton did the Bond honors, A-ha had to merge their distinct synthpop sound with famed series composer John Barry, not an easy task. I reckon it would take a couple of listens to "The Living Daylights" for one to realize there's a lot of cool little things going on in this Cinemascope sounding song, a wonderful mix of sound elements to make this a repeater. Heavily treated electric guitars, hard acoustic guitar strums at emphatic parts, galloping drums with suddenly building snares, twinkling synths, a distorted sax solo, and the falsettos and harmonies of the group itself. John Barry comes in loud and clear with his trademark brassy blasts during the intro and the chorus. Listen for the in-time horseshoes when the song settles in about halfway through before that dirty sax solo. 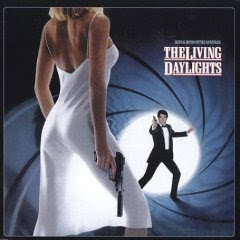 Instead of some of the ballads Bond fans have been treated through over the years, "The Living Daylights" is pure musical adrenaline for rocketing down the highway.